I think the number one reason that most people don't actively participate in their favorite hobby is TIME. I have said COUNTLESS times that I wish I had more time for scrapbooking….DIY…crafts, etc. I have recently started to realize that I have the same amount of time as everyone else. I make the decisions on how I will use my time. I really only have myself to blame if I am not making time for the things I love doing! I have started doing a better job allocating my time and I wanted to share some of my tips with you! A few of these tips are geared toward scrapbooking in particular, but most would help you no matter what your hobby is! 1. Take a Hard Look at Your Free Time: Do you make time to watch TV? Do you make time to surf the internet or scroll through Facebook? These moments could be used on your favorite pastime. My husband and I do enjoy watching television together in the evenings. It is our time to unwind together. I have started keeping some scrapbooking magazines nearby and thumbing through them for ideas as we watch TV. Other times I may sort or organize pictures while we sit together. I know that multitasking can have a downside, but sometimes it can help you accomplish a little bit more! 2. Schedule Hobby Time: I actually write down on my calendar times when I am going to scrapbook. I have my husband put it on his calendar so he knows he will be on dad duty during those hours. I book it when we don't have other special events going on…but the key here is to book that time. 4. Rethink Your Space: I am very fortunate to have an “office” in our house that I share with my husband. I have all my supplies in there and my own area. I finally realized that if I moved a small child's desk into the room for my daughters to use…I may get more done! It really has helped for the kids to have an area to do crafts while I work. They may only be occupied for an hour…but that is one more hour of hobby time! 5. Leave Unfinished Pages Out: if you are working on a layout and don't finish it….leave it out on your desk. You can cover it with a piece of clear Plexiglas so that it stays safe. Now you will see it each time you walk by…you can get new ideas on how to finish it…and it will be a great reminder to FINISH IT! This tip can work for other hobbies as well…if the unfinished item is in view…you can't forget it! 6. Simplify Your Hobby: if you are really pressed for time you may have to adjust your expectations a little bit. I don't have 4 hours to spend on one layout….so most of my layouts are fairly simple. If you are a crafter that makes mosaic tile projects…you may want to focus on completing a flower-pot instead of a huge bird bath! Keeping your expectations realistic will keep you from getting discouraged! 7. Organize Your Supplies: this one catches me from time to time! You don't want to spend half of the time you have allotted looking for something! If you know where everything is and everything has a place it will save you a lot of time! 8. Use Kits: if you are a scrapbooker there are lots of great kits you can buy! You can try monthly subscription kits or even buy kits at Joanns. Sure it isn't quite the same as creating a layout completely on your own…but what is your end goal? My goal is to get my pictures scrapbooked for my family to enjoy! They don't know or care who came up with the layout design! Plus you can do a lot of “freestyle” with kits…the key is the time it saves you because you don't have to look for coordinating paper and embellishments! 9. Get an Accountability Partner: I know it sounds crazy…accountability partners are serious business…more for keeping you from doing something that could harm you, etc. BUT…I think if you have a friend that you like to craft with it will help you both. You can make a point of getting together once a month to work together or taking a weekend once a quarter! Set goals together of what you want to accomplish this month or year. How many scarves will you knit this year? 10. Believe You Deserve It: Some people don't make the time for their hobbies because they don't feel like they deserve it…they don't feel worthy…they think that everyone else's needs are more important than their own. I am the first one to give up my time, my food…you name it, I have probably given it up…for my kids. I used to feel guilty for being away from them to go scrapbooking. I just can't allow myself to have those feelings of guilt anymore. It is OK to take a little time for yourself now and then. Plus…by making time to scrapbook I am creating a memory book for THEM that they will cherish for years to come! I know that many of you don't scrapbook, but I think these tips can help with almost any hobby you may have! Making time for your hobbies will make you a happier person!! What are your hobbies? 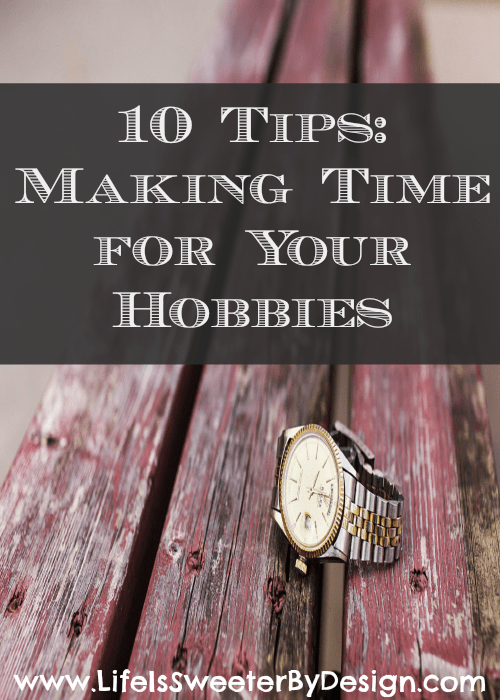 Are you making time for your hobbies? If not…what is standing in your way? These are really great tips. I have a hard time making time for my hobbies and I miss them. I think that if I would schedule time to do them, I probably would end up doing them. Having a kit to help out sounds like a great idea too. It is helping me to get some hobby time in!! I’ve got to give a few more of these a try. I say a few more, because I already procrastinate on my housework, and I still don’t have time! These are fantastic tips. It has been a while since I’ve done any crafts. I enjoy crocheting but if i don’t have anyone to make something for then I don’t do it. I might try something else though. I tried crochet many years ago, but really stunk at it. 🙁 Maybe I should try again now that there are youtube tutorials, etc.!! I love watching Korean and Japanese dramas, so I guess that counts as my hobby. And yes, most of the time, I skip on housework just to finish the entire series. Haha! Good for you!! 🙂 It will always be there! These are great tips! I always make sure I spare some time for my hobby. It’s the only time I can be alone and relax. That is great Elizabeth! You are way ahead of so many people by taking that time for yourself! All these are great tips. Lately I have been missing many of my hobbies that were ones my favorite for which I used to spend so much of time. These tips would really help in making sure you can schedule something to get back on those. These are great tips. It’s important to find “me time”…even though many of us feel guilty about doing it. It’s good for mental sanity. 🙂 I love to scrapbook as well but don’t find time for it much at home (I get a lot done when I attend crops). But, you’re very right….it’s all about making decisions. Thanks for the food for thought (and I’m enjoying your blog). Thanks Amy! I love to go to crops too….that is the best way to get a lot done! Thanks for stopping by!